In September 1931 half the Royal Navy went on strike when the Atlantic fleet, which was anchored at Invergordon on the Cromarty Firth in Scotland, mutinied. Some 12,000 seamen, many of them facing a 25 percent pay cut, refused to obey orders. Their mutiny had an immediate and dramatic impact on British society. The naval pay cuts of 1931 were part of a vicious austerity package imposed by Ramsay MacDonald's National government to save the pound and bail out British capitalism. The package included a massive cut in unemployment benefit and compulsory wage cuts for all workers in the public services. In 1929--the year of the Wall Street Crash--MacDonald had been elected leader of a new minority Labour government. Immediately his cabinet faced an economic crisis. Under the impact of a sharp worldwide economic recession, unemployment in Britain doubled from 1.4 million to 2.8 million by the end of 1930. This represented 13 percent of the workforce, and in some areas the figure reached 70 percent. The state had to borrow money or raise taxes to pay for increased benefits, and every time the Labour government tried to raise loans or hinted at increasing taxes the City responded with an investment strike. Arms magnate Lord Weir demanded that the unemployed be made to pay for the crisis. 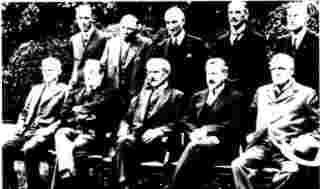 The Labour government limped on aimlessly until the summer of 1931, when it was hit by what Ramsay MacDonald called 'the full force of an economic blizzard'. Like the Blair government today, MacDonald's Labour government was unwilling and unable to change the ebb and flow of the capitalist economy. It was like a cork on a wave trying to move the tides underneath. In August 1931 the banks screamed for savage cuts and MacDonald proposed a 10 percent cut in unemployment benefit. A majority of the Labour cabinet agreed, but when he failed to get the unanimous cabinet support demanded of him by the bankers, he and his cabinet colleagues--Philip Snowden and Jimmy Thomas--broke with the Labour Party to form a National government with the Tories and the Liberals. In the 1931 general election the National government won 550 seats, and the non-MacDonald Labour Party held only 46. MacDonald's betrayal was met by a massive feeling of anger and bitterness among the working class. This mood helped to spark the mutiny at Invergordon. On the evening of 12 September, at a mass meeting held in the local football park, the sailors based at Invergordon voted unanimously to strike the following morning. They returned to their ships singing the Red Flag. At 6am on Tuesday 15 September the crew of the battleship Rodney refused orders and struck. As each ship's company stopped work they gathered on deck and cheered--passing the message down the line. All radio communications were shut down. Even the marines--the traditional enforcers of naval order and discipline--threw in their lot with the striking seamen. The mutiny got quick results. Within 24 hours the Admiralty capitulated and restored part of the wage cut. It also terrified the ruling class and created a financial panic which demolished the 'Gold Standard'--the monetarist mechanism the miners had been sacrificed for in 1926. The mutiny also inspired working class resistance. In the wake of the Invergordon events a massive demonstration against wage cuts took place in Hyde Park, consisting of civil servants, teachers and postal workers--groups with no previous history of struggle. And on 21 September the National government discovered 'just grievances' and the wage cuts for teachers, the police and armed services were reduced. On 7 October the National Unemployed Workers' Movement led a riot of 50,000 unemployed in Glasgow. The next day 30,000 did likewise in Manchester, followed by another demonstration of 60,000 in Glasgow. Later there were reprisals. Some 397 sailors were purged as troublemakers, and not just from the Atlantic fleet, showing that there was widespread support in other ports. The Communist Party's Daily Worker gave complete support to the mutineers. Its offices were raided, and its printer, business manager and an editorial board member arrested under the Incitement to Mutiny Act of 1797. The government was clearly worried about Invergordon, for it helped inspire British workers to fight back through the 'Hungry Thirties'. What can we learn for today? In 1929 Labour was a minority government and had to deal with the consequences of the Wall Street Crash. Today Blair has neither of these excuses--yet. But New Labour's popularity is already haemorrhaging fast. The Invergordon Mutiny and the events it inspired show that the most unlikely people can move very quickly from anger to direct action.